It’s all too easy for CIOs and technology management to build a strategy around any new technology area that is focused on delivering lower technology costs and greater operational efficiency. However, to get your cloud strategy right, you have to learn to move away from measuring the success of change against technology management care-abouts and focus on the priorities of the business. Forrester’s Business Technographics® surveys show a stark disconnect between technology management’s and the business’ desired outcomes from cloud computing; embracing the shift to cloud services means driving and measuring its success against metrics defined by the business before those of IT. To get this right, change must first happen in the culture of the CIO’s organization, and this change must start at the top. This report outlines the strategic plan of Forrester’s solution for CIOs working on cloud computing. 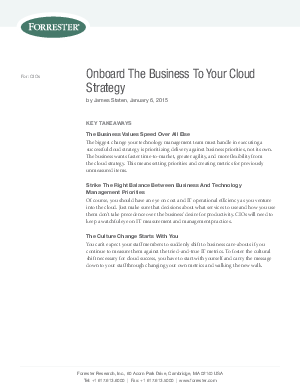 This report is designed to help you onboard the business to your cloud strategy. This is an update of a previously published report; Forrester reviews and updates it periodically for continued relevance and accuracy.